ANALYSIS: If director Richard Stanley and author William Gibson could have a kid (and that kid took acid), the end result would be NIRVANA. It is an interesting movie in parts, but the last half of NIRVANA is the part that works the best. The production design and costume design are fantastic (not bad on a $10 million budget). Even though NIRVANA stumbles for the first half of the movie, it does redeem itself. The movie has a weird first half before it decides to pull the threads together and actually make NIRVANA work. NIRVANA is one of those movies that Miramax has decided to release to DVD after it has set on a shelf with other movies that are also going to finally see the light of day. NIRVANA is a thinking person's sci-fi movie. The thing that has me worried is the running time listed on the DVD. The Region One DVD has a running time of 96 minutes, but the entry for NIRVANA at the Internet Movie Database has a listed running time of 114 minutes. Is this movie another victim of the Infamous Miramax Cutting Room that fans of Jackie Chan and Jet Li movies often complain about (some Hong Kong movies from the two have scenes cut from the North American releases)? The plot of NIRVANA deals with two plotlines. One deals with Solo (Diego Abatatuono), the main character in the video game NIRVANA, who becomes self aware when a computer virus infects him. He tries to make characters in the game understand what he know nows and he wants Jimi (Christopher Lambert), the creator of NIRVANA, to delete the game. The other plot deals with Jimi's quest to find the woman (Emmanuelle Seinger) that left him a year ago while he goes to serach out for a hacker and a computer virus to help him destroy a copy of the game in the Okosama Starr mainframe before it gets downloaded by millions on Christmas Day. Okosama Starr is the game company that Jimi works for. He is joined by Joystick (a man who sold his eyes and had them replaced by two small black and white camera eyes) and Naima (who has no memory of her own, but she can live the memories of the others through her physic link) who has blue hair. Every character tries to come to terms with their lives as the events unfold. They go from Marrakesh to Bombay City in one of the movies that Christopher Lambert is most fond of. 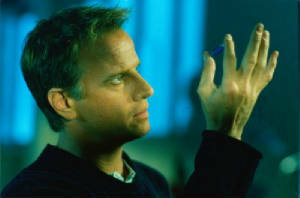 Christopher Lambert is one of the few actors I like to watch all the movies he has been in. He delivers a certain performance whether the movie is good or bad. It is a shame that NIRVANA was released in other parts of the world back in 1997 and 1998 where it finally gets exposure in the USA now. Some interesting concepts are present in this movie mixed with some philosophy. Solo is a stand-out character as Solo wants his life to end (because he doesn't want to be killed in the game again) and even tries to tell the prostitute she is only a game character. VIDEO/AUDIO: NIRVANA is presented in 1.85:1 Anamorphic Widescreen. Colors are nice and vibrant. Blacks are OK, but sometimes they lack good detail. Image sharpness and detail is great, but the transfer has a slight presence of grain. You can hear the movie in English 5.1 Dolby Digital with the option of English, French, or Spanish subtitles. Dialogue can be heard OK, but the other sound elements are just average at times while the music benefits the most. Music and sound effects are loud, but they lack bass. Sadly the original Italian language track isn't on this DVD (or even a French language track) since NIRVANA is a French-Italian co-production shot in Italy back in 1997. The English dubbing isn't the best because you can tell the movie has been dubbed at times (even when Christopher Lambert has dubbed his lines into English). A little adaptation on the script to make the words synch up to match up more with the lip movements better. EXTRAS: None except for a 25 Years of Miramax trailer. DVD Cover Art: It is OK, but I like the cover art they show in the insert that is included in the DVD of THE I INSIDE better. FINAL ANALYSIS: NIRVANA is a sci-fi movie that may turn some people off. It is a movie that requires a little patience at times, but it is worth a rental for William Gibson and Christopher Lambert fans. Definitely a rent for fans of intelligent sci-fi and cyberpunk. Hopefully, a better edition of the DVD will make it to the USA one of these days.